HAMILTON — Watching Ricky Ray being carted off the field last month convinced Andy Fantuz it was time to call it a career. The 34-year-old native of Chatham, Ont., retired Thursday after 12 CFL seasons with Saskatchewan and Hamilton. Coincidentally, Fantuz made the announcement prior to his former teams squaring off at Tim Hortons Field. Ray, 38, suffered a neck injury in Toronto's 41-7 home loss to Calgary on June 23. After Ray was sandwiched between two Stampeders defenders, play was halted 20 minutes as Ray received medical attention before leaving on a stretcher, his head immobilized, and taken to hospital. "When Ricky went down, we (Fantuz and wife, Amanda) were already an inch away from saying, 'We're totally good with it,'" Fantuz told reporters at Tim Hortons Field. "We just looked at each other and we knew. "We said, 'OK, that's it, this is going to be it.'" And that's when Fantuz figured it would be fitting to formally retire on the day his two former teams were playing each other. The six-foot-four, 221-pound Fantuz played in 148 career games — 138 starts — with Saskatchewan (2006-11) and Hamilton (2012-17). He registered 637 catches for 8,363 yards with 44 touchdowns and 17 100-yard games. Fantuz, who wore his '07 Grey Cup ring Thursday, appeared in 18 career playoff games, recording 76 catches for 992 yards and six TDs. He finishes ranked fourth all-time among Canadians in receptions and 18th overall in CFL history. "I've got my ring here, I cherish this," he said. "I cherish every person on that team and everyone who impacted that season. "We had some great other years, my other four Cups we were close but that's a lesson for all the young kids coming up. Don't take it for granted. You've got to seize the moment." Not blessed with blazing speed, Fantuz had a knack for finding open areas in a defence. He ran crisp routes and was often hard to bring down after the catch. Fantuz was named the league's top Canadian in 2010 after recording 87 catches for a career-best 1,380 yards and six TDs. He played in five Grey Cup games, winning one in 2007 with the Roughriders, but was named the game's outstanding Canadian twice. Fantuz registered a career-best (and club record) 101 catches for 1,059 yards and five TDs with Hamilton in 2016. Fantuz battled injuries in recent years, playing just three games in 2017 after returning from a torn ACL. He became a free agent in February and said he had offers to play but didn't want to be away for the birth of his daughter. "Football has been a huge focus of my entire life and taught me so many things, both in the game and in life," he said. "Having our first daughter, Abigail, not even three weeks ago just kind of put the next chapter of my life into perspective and really gave me that purpose." Fantuz said he wants to remain involved in football in some capacity but right now is focusing on his family. "First things first, be a good dad, be a better husband, have more time with my family and friends," he said. "I'm definitely going to stay involved in football in some way. "I'm currently working in the health-and-fitness industry with a system of training and unique technology that helps young athletes maximize their abilities. That's really exciting for me and taking up a lot of my free time." In February 2011, Fantuz signed with the NFL's Chicago Bears. He appeared in two exhibition games and had a pair of catches for 19 yards before being waived Sept. 2. He rejoined the Riders five days later. Fantuz signed a four-year deal with the Ticats as a free agent prior to the 2012 season. The Roughriders picked Fantuz third overall in 2006 after an outstanding collegiate career with the Western Mustangs. He won the Hec Crighton Trophy as Canadian university's top player in 2005. 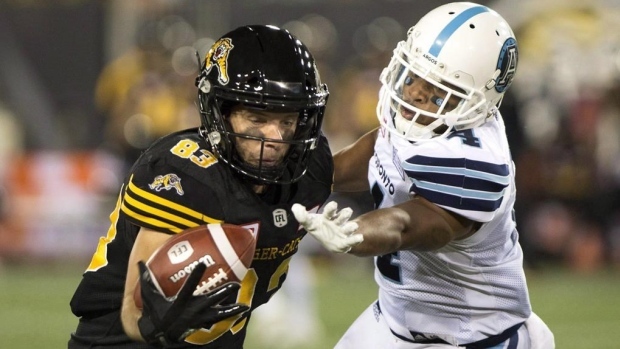 Ticats GM Eric Tillman has had the unique opportunity to see Fantuz develop, on and off the field. He was the Riders' GM in '07. "What Andy accomplished on the field is so well documented," Tillman said. "But the growth as a person, to see Amanda back there with the little one represents the circle of life. "It's very appropriate you're being honoured with both franchises here. You're loved and respected in both places. Savour the moment, my friend, you deserve it." However, Fantuz did leave the door open to coming out of retirement this fall should a team need a veteran receiver to help anchor a playoff run. "I'm very happy with where I'm at right now today but who knows?" he said. "I don't want to be that guy who's making a big deal and just un-retire tomorrow but never say never. "I'd like to be remembered as a player, as a competitor as a positive impact on both inside the locker room and in the community."